Cheddar's Grand Re-Opening & Giveaway! You are here: Home / Expired / Cheddar’s Grand Re-Opening & Giveaway! Cheddar’s Grand Re-Opening & Giveaway! 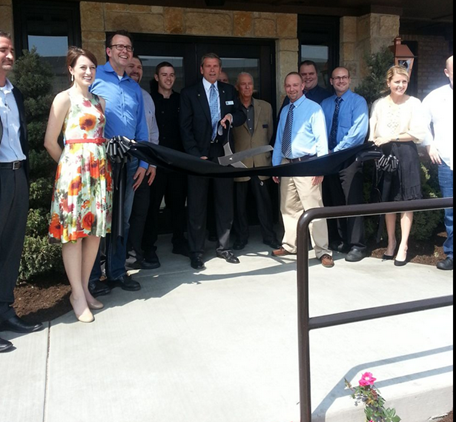 I was invited to attend Cheddar’s Grand Re-Opening recently and I was so glad I got to go! Y’all know about my weight loss a couple of years ago and how I keep it off by eating normal portion sizes, which is NOT what we normally eat – you would be surprised if you started looking at everything you eat and just eating the portion size! But, I have gone off the subject – a little! 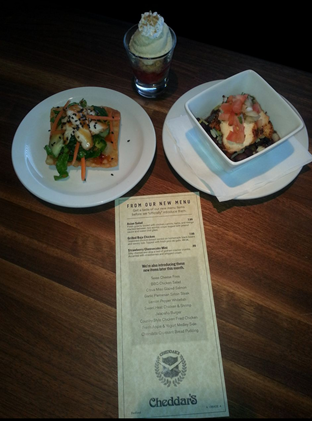 Cheddar’s has a great new menu and I got to try some of the new items and they were all great! We got to hear from and talk with the chef at the Bedford, TX location and told us that all of the new items were under 550 calories! Nice! Then we all headed inside and heard from Cheddar’s management and then the head Chef. 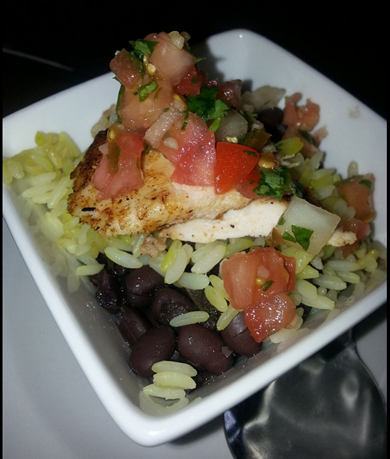 The chef also said that most of Cheddar’s dishes are made in house from scratch! That always makes for a healthier meal! 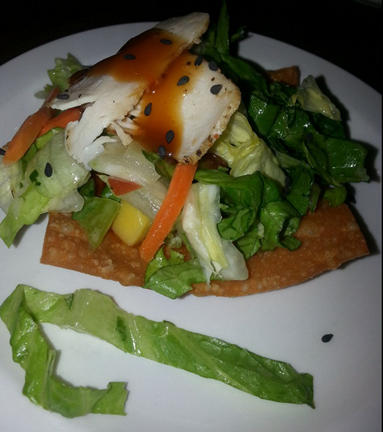 Fresh greens tossed with chicken, carrots, herbs, and mango stacked between two wonton crisps topped with peanut sauce and sweet chili glaze. In this smaller version you can see that the chicken is thinly sliced and they have tossed it in with the vegetables so that the chicken is easier to eat and is there thru the entire dish. Nice! 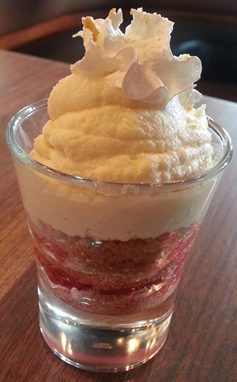 This is a Strawberry Cheesecake Mini Silky cheesecake atop a bed of graham cracker crumbs. Accented with strawberries and whipped cream. This is a great idea, in my opinion, for a few reasons! These are just $.99 – that means you can get the kids a dessert without having to break the bank, it also means you don’t have to spend $5.95 on one and every one shares! lol Also, it’s not too much, not too big, won’t make you feel you shouldn’t have eaten it! Next time you are trying to decide where to eat out, try Cheddar’s! I can’t wait to try the new Parmesan Crusted Sirloin! Not only will you be the first to know about new menu items, special offers, and the latest scoop; but you will also have a chance to be heard as we consider new dishes and ideas together. When you sign up for their email club you’ll also receive FREE chips and salsa when you go in! Cheddar’s values your business and is excited for you to try their new menu items, so they are offering $10 Gift Cards to 3 lucky reader! Mandatory Entry: Leave a comment telling us which new item you’d like to try! 1. Join the Grocery Shop For FREE Facebook Group <—- Click Here (so, you won’t miss any more deals) – then come back here and leave a comment saying you did. 2. Sign up to receive Dian’s Daily Deals in your email <—- Click Here – then come back here and leave a comment saying you did. 3. Follow Grocery Shop For FREE on Twitter <—- Click Here- then come back here and leave a comment saying you did. 4. Add Grocery Shop For FREE to your RSS Feed <—- Click Here – then come back here and leave a comment saying you did. 5. Follow Grocery Shop For FREE on Pinterest <—- Click Here – then come back here and leave a comment saying you did. 6. Like Grocery Shop For FREE on Facebook <—- Click Here – then come back here and leave a comment saying you did. Then come back here and leave a comment saying you did. You can do #’s 8-9 once daily – just make sure to come back and comment after each time to get an extra entry! This giveaway will end Saturday, September 7th, 2013 at 11:59 pm Central time and the winner will be emailed soon thereafter. Make sure you add [email protected] to your address book, so you get the email if you win! This giveaway is open to US residents only, 18 years old and above. No prize substitutions allowed. Only email addresses used for the giveaway will be eligible to claim the prize. You should assume that the owner of this blog will receive free products in exchange for the post. Any and all reviews posted are based solely on my own experience and may be atypical. Please practice due diligence in making any related purchase decisions. I’ve never been to Cheddar’s but I have always wanted to go! My family likes Cheddars chicken tenders. It’s been a long time since I’ve been to Cheddar’s, but I remember having a cheddar burger and it was amazing. Would love to go back! It all looks and sounds so good! 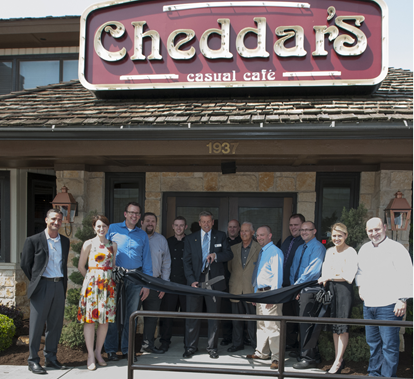 We just recently had a cheddars open in in our area and I can’t wait to try it. Oh wow. My son has always said they’re the best but I steer away from chains. These options look fantastic and I look forward to trying them with my ‘new email club member’ chips and salsa. my absolute favorite thing to eat at cheddar’s is their fabulous fish tacos!!!! I love the Onion rings and reg fried catfish, chicken tenders and the chicken salad. My husband loves the chicken potpie he gets it everytime. Cheddar’s onion rings are out of this world! 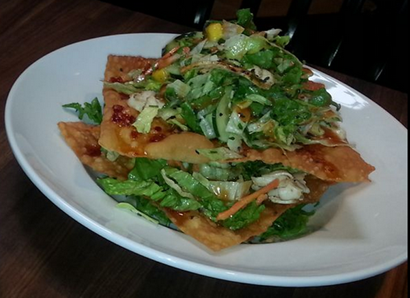 I have never been to Chedder’s but I would love to try the Asian salad! We LOVE Cheddars! It is our date night place and I LOVE their cheese burgers. A Cheddars is opening in my area soon! Can’t wait to try it! The Asian salad looks amazing!! I can’t find where to enter the drawing, so I hope this will work. Thanks!! I would like to try the Asian Salad. 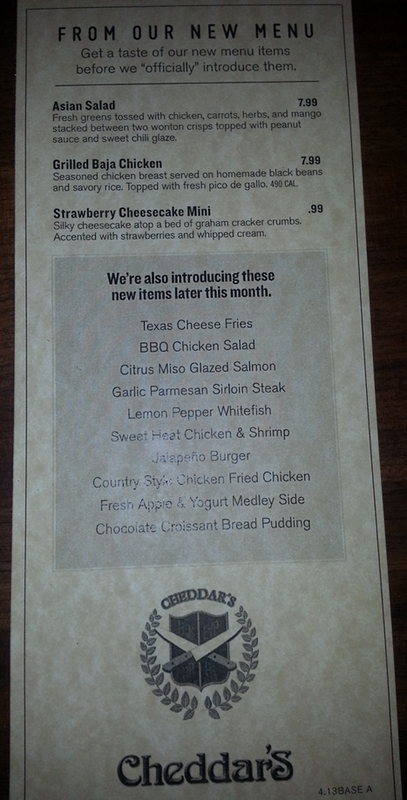 The strawberry cheesecake mini sounds sooo good! I would love to try the Asian Salad. I am part of the Grocery Shop for Free Facebook Group. I follow Grocery Shop for Free on Twitter. I follow Grocery Shop for Free on Pinterest. I follow Grocery Shop for Free on Facebook. I follow @CheddarsCafe on Twitter.